They Own It All (Including You!) 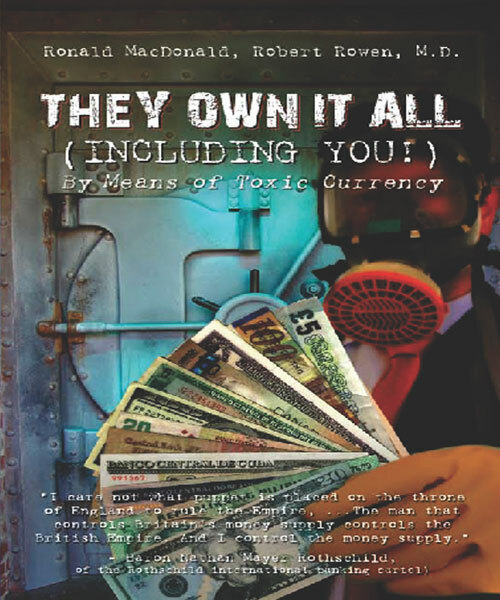 By Means of Toxic Currency by Ronald MacDonald and Robert Rowen, M.D. by Ronald MacDonald and Robert Rowen, M.D. Seldom in history does a book come along where readers comment that it should be in the home of every American family, and placed on the mantle right next to the family Bible. But that is what readers of this book are saying. With very simple grammar, They Own It All, tackles a subject craftily hidden from the average man – the true nature of modern currency and its impact on his personal life and freedom. Most everyone knows that something is desperately wrong in America, and the entire world for that matter. Imagine being the owner of a manor. One day you return and find that your servants have taken over the estate, and they place you in chains to be their chattel – forever! As the book unfolds, the reader finds that this is what has literally happened. We now have governments malignantly growing, freedoms destroyed, and our every movement tracked. We need permission from the entity we created (government) for most anything we do in life. The authors prove that this amazing feat was done through what they call “toxic currency”. They show how Federal Reserve Notes are really the privately owned property of the private offshore corporation known as the Federal Reserve System. You do not own what is in your pocket because it belongs to “them”. Worse, the authors show how the currency carries a hidden lien that contaminates everything which is transacted for it. Hence “THEY” own it all by hidden liens, which represent the creditors 100% interest in all transactions. Since you own nothing, you are devoid of all rights. How? Even to exert the most basic of rights, the right of contract, you must have your own unliened property with which to offer. If you are using the property of a third party, you are beholden to his terms and conditions (agency regulations) for its use. Worse, since it is a product in international commerce, it has compelled you into admiralty jurisdiction and lifted you off both the land and common law. It is from the common law that you once had unalienable rights. Today those unalienable rights (given by the Creator) have been replaced with privileges and immunities given to you by the Creditor. You are a debtor (using debt notes). Debtors do not have any rights. You are legally chattel (property of the Creditor) in the eyes of the law through your voluntary use of and transactions with the toxic debt currency. This book explains the difference between transactions with gold and silver coin within the common law and negotiable instruments in international admiralty law. It is night and day. You have neither title, rights, nor interest with negotiable instruments (currency) but possession by “privileges” only. You will discover that what you think are your courts are really Admiralty courts of the Creditor. Your courts were silenced when your gold (wealth) was stolen by your government (servants) in 1933, with a bankruptcy of the government admitted in the Congressional record. Hence, the American government, which is insolvent, is acting at the behest of its hidden creditor, as would anyone in a perpetual chapter 11. This masterfully written and documented book will ultimately become an American classic. It should be in every home and library, to educate all of us on the real nature of “money” and how the international bankers can control every aspect of your life simply by controlling (owning) the currency. Knowledge will provide the means to remedy the situation both on a personal level and national level, and with education of our children, prevent it from ever happening again. The authors’ treatise on transacting in gold/silver coin within the common law is priceless, as well as appendix H. The latter is a document from a major taxing agency in California that returned lawful money (gold coin) of the United States submitted to the agency in payment of alleged taxes. The agency called the coin an “invalid financial document”. The authors cited a recent federal case that went all the way to the Supreme Court in which the district court determined that lawful money (gold coin) is literally invisible to the government! So what are we doing continuing our transactions in “their” property? Understanding the underlying problem provides the means for the remedy, including instant remedies. Reading this book will expose the invisible “Matrix”. And, when the invisible becomes visible, it will remain so for all time. They Own It All (Including You!) provides the means for Americans to take their country back and become the master of their servant government again. It may be the only book one needs to take to a “Tea Party” as the book is the first since the imposition of the income tax to identify what “income” really is. (Hint- it deals with transaction in Federal Reserve Notes). It is not just a must read. It is an essential read since it connects the remaining dots that even those schooled in the cause of freedom for years have likely missed.